Quotes about goodnight are a fun read for those tucking in a child every night or wishing sweet dreams to the love of their life. A goodnight wish is one of the most beautiful gifts you can give. Every time you say those words, it makes them feel that they are special and matter. A goodnight wish has a soothing effect and also makes a person feel relaxed, helping them enjoy a better sleep. Leave those closest to you with a positive thought before they sleep. Whether it’s a friend, a loved one, or your partner, make sure to make them feel special with a lovely goodnight message. Here are some famous, funny and sweet good night quotes and wishes you can share with those who are dearest to you. Enjoy these quotes about goodnight. Life’s most soothing things are a child’s goodnight and sweet music. I knew how to read a contract by 10 years old, but I didn’t know what it meant for somebody to come in and tell me they loved me and kiss me goodnight. That’s a problem. At once, good night- Stand not upon the order of your going, but go at once. You’ll be the last thing I think of before I fall asleep and the first thing I think of when I wake up. Good Night! They say that God sprinkles his blessings upon the earth every day and I think I have caught one. It’s you! Wishing you a good night and I love you. Dreams fade with morning light, Never a morn for thee, Dreamer of dreams, goodnight. And tonight I will sleep with you in my heart. And I start sleeping and dreaming and I think I’ll dream about you, all through the night. Sleep is just a way of thinking of all the memories past that day…. so goodnight, sleep well! To hearts which near each other move From evening close to morning light, The night is good; because, my love, They never say good-night. Parting is such a sweet sorrow that I shall say goodnight till it be morrow. Whenever one of my children says, ‘Goodnight, Daddy,’ I always think to myself, ‘You don’t mean that. I love you baby goodnight. There goes my life. God works the night shift. Not you! Don’t spend another sleepless night trying to figure out your issues, trust that the Lord is working it out. 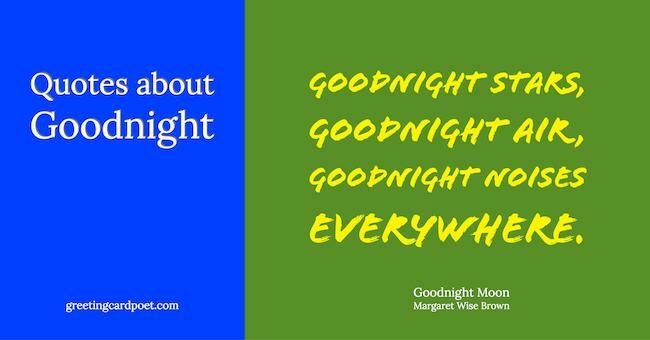 Tip: Quotes about goodnight make great captions for Instagram or Facebook posts. My day won’t certainly be over for I have something left to do. I just couldn’t sleep yet without saying I love you. Good Night! Every child fights naps when they’re young, and every adult wishes they could nap. Go figure. Six hours for a man, seven for a woman, and eight for a fool. Good Night! Have some suggestions for quotes about goodnight? Let us know via our Contact page. Thank you.